Aided by a steady growth of the manufacturing sector, the Industrial production grew by 5.3 per cent during the first quarter of the current financial year. According to Quick Estimates of Index of Industrial Production, the sector grew by 5.7 per cent during June as against 4.5 per cent during the corresponding period of the previous year. AirTel created history in Punjab by becoming the first service provider in the country to cross 5,00,000 customer mark in just 17 months. This has been the fastest growth in the cellular industry in India. More than 36 lakh subscribers were added by cellular operators during the first four months of the current fiscal. This represents almost 300 per cent growth as compared to the same period last year where 13 lakhs subscribers were added. The upsurge in capital market which hit a 29-month-high last week seems to have bypassed the IT sector where top 25 companies, including Wipro, Infosys, HCL and NIIT, lost almost Rs 66,500 crore in market value since March 8, 2001. The government today cleared 26 proposals envisaging Foreign Direct Investment worth Rs 16.08 crore including a Rs 5.03 crore plan by Citi Corp International for setting up a unit in Mumbai to manufacture active pharmaceutical ingredients and bulk drugs. To give a fillip to Jammu and Kashmir’s industrial sector, the state government has decided to expeditiously revise the industrial incentive policy, Deputy Chief Minister Mangat Ram Sharma said today. Haryana is trying to develop Gurgaon and Manesar as hubs of gems and jewellery export. Even after the split, UTI Mutual Fund continues to hold largest market share of 14.47 per cent closely followed by ICICI Prudential, HDFC Standard Life and Templeton in the over Rs 1,00,000 crore industry. “When I read about the evils of drinking, I gave up reading” — this quote of Henry Youngman couldn’t have been more apt. A study of people aged 45 by researchers at Stirling Money Than University has revealed that moderate drinkers make on an average 17 per cent more abstainers. India’s tea exports during the first half of 2003 has dipped by 27.95 per cent to 57.15 million kg, Tea Board officials today said. Hyundai Motor India today flagged off maiden shipment of its flagship “Santro” brand of passenger cars to European markets of Italy, Spain and Netherlands. The first consignment despatched from the Chennai port consists of 1,500 units of Santro to be marketed in Europe under the brand name “New Atos Prime” at a price of over 8,500 euros, J I Kim, Managing Director of the company told reporters. Aided by a steady growth of the manufacturing sector, the Industrial production grew by 5.3 per cent during the first quarter of the current financial year. According to Quick Estimates of Index of Industrial Production, the sector grew by 5.7 per cent during June as against 4.5 per cent during the corresponding period of the previous year. 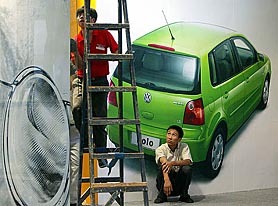 The Index of Industrial Production for the first quarter of 2002-03 stood at 4.3 per cent. The manufacturing sector registered a growth of 5.5 per cent during April-June, 2003, as against 4.1 per cent during the same period of the previous year. 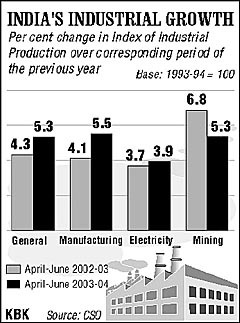 While the electricity sector showed a growth of 3.9 per cent during the first quarter of current fiscal as against 3.7 per cent during the same period of last fiscal, the mining sector registered a decline to 5.3 per cent as against 6.8 per cent during April-June, 2002. The Mining sector also showed a decline to 5.9 per cent during June, 2003, as against 9 per cent growth registered during June, 2002. AirTel created history in Punjab by becoming the first service provider in the country to cross 5,00,000 customer mark in just 17 months. This has been the fastest growth in the cellular industry in India. On an all-India basis there are seven other cellular service providers who have crossed the 5 lakh mark and all of them took between 57 to 72 months to do so. As per COAI figures, the customer base of AirTel Punjab is 5,08,902 as on July 31, 2003. Another achievement is that AirTel has been growing in Punjab at the rate of 21 per cent every month, as against the national average growth rate of 6 per cent. According to Mr Vinod Sawhny, CEO, Bharti Mobile, “We have set another benchmark in the country by being the only operator to have crossed 5 lakh figure in 17 months. At the core of this is our strategy that focuses on rapid network expansion, customer endearment by being the first in the country on many instances to introduce new products and services and our continuous endeavour to build a stronger brand through customer centric and solution specific communication. He said AirTel will continue to propel this unprecedented growth by increased focus on rural markets which hold a huge and untapped potential. AirTel has the largest network with the widest coverage in Punjab. AirTel has invested in 252 cell sites in Punjab, which cover more than 150 towns and over 1500 villages. By the year end, AirTel would have 325 cell sites in Punjab. More than 36 lakh subscribers were added by cellular operators during the first four months of the current fiscal. This represents almost 300 per cent growth as compared to the same period last year where 13 lakhs subscribers were added. The WLL (M) category has shown an unprecedented growth, the net addition exceeding 31 lakh subscribers as compared to less than one lakh subscribers added during the corresponding period of the previous year — a massive growth of 31 times. The combined growth of cellular and WLL (M) exceeded 67 lakh as compared to 14 lakh during the same period for the previous year, figures released by today by the Telecom Regulatory Authority of India (TRAI) said here. During July 2003, 12 lakh WLL (M) phones were added, and 11.5 lakh cellular phones were added, with a combined addition of 23.5 lakhs, a record for growth in any single month. “The unprecedented growth is a result of growth oriented, aggressively consumer friendly and forbearing tariff policies recently adopted by the regulator”, a TRAI release said. The growth in talk-time per subscriber in terms of minutes of use (MOU), is also showing an upward trend specially for the wireless based services (1.5 times of last year) due to reduction in the cellular realisation, free incoming calls and drastic reduction in STD and ISD charges. “The explosive growth has been possible due to the Indian cellular and WLL (M) realisation falling even below the Chinese realisation, for the first time this year. Earlier, according to a study, Indian realisation during the last five years were 1.2 to 1.5 times higher than Chinese realisation”, the TRAI statement said. This trend is helping the operators with their revenues and margins. The incremental capital expenditure (capital investment) for addition of marginal subscribers, in wireless based services have now reduced to a level of Rs 5,000 to Rs 6,000. According to a study their operations become viable for an ARPU ( Average Revenue per user per month) of Rs 250 to 300 only, for the additional customers — the existing ARPU being of the order of more than Rs 500. The upward movements in Sensex to 3,884 was mainly due to gain in old economy majors like ONGC with a m-cap of over Rs 75,000 crore and Reliance with over Rs 50,000 crore. In contrast, the IT, Communication and Entertainment (ICE), companies eroded almost 50 per cent of their market capitalisation from Rs 1,35,740 crore when the Sensex was at its previous high in March first week in 2001 to Rs 69,243 crore in the last week when the BSE index touched a new high. Most of the K-10 stocks, which had once been the fancy of tainted broker Ketan Parekh, eroded by 80 per cent in m-cap, CMIE data reveals. ICE meltdown was reflected from the m-caps of Wipro, Infosys, HCL, NIIT, HFCL, Sterlite Optical, Hughes Software, SSI Ltd, Silverline Technologies and Satyam Computers. Wipro’s m-cap came down by Rs 29,234 crore (57 per cent) to end last week with Rs 22,351 crore in the last 28 months, while Infosys lost Rs 10,268 crore (30.4 per cent) of its value to finish with Rs 23,563 crore. M-cap of HCL eroded by 62 per cent to Rs 5,146 crore while that of NIIT was down by 88 per cent to Rs 471 crore. In the telecom sector, HFCL witnessed further erosion in market value by 75 per cent to Rs 780 crore while Sterlite Optical shed 86 per cent to Rs 325 crore after 29 months. The government today cleared 26 proposals envisaging Foreign Direct Investment (FDI) worth Rs 16.08 crore including a Rs 5.03 crore plan by Citi Corp International for setting up a unit in Mumbai to manufacture active pharmaceutical ingredients and bulk drugs. The proposal, cleared by Finance Minister Jaswant Singh, had been earlier approved by the Foreign Investment Promotion Board. Among the proposals cleared is Rs 6.90 crore investment by Malaysian company Elken Sdn BhD for manufacturing bio purifiers in Bangalore. A Belgian company, Financiere DEA Applications, plans to manufacture electrical outdoor luminations and will invest Rs 1.55 crore as FDI for the purpose at its manufacturing plant in Faridabad. He announced this after a high-level meeting, which was attended among others by Principal Secretary (industry and Commerce) Sahsaraman and other senior officials. Mr Sharma said suitable modifications in the earlier incentive policy would be made to make it more entrepreneur-friendly. “The colossal losses witnessed by the industrial sector during the last 12 years of turmoil demand a comprehensive approach,’’ he asserted and added that a viable and vibrant industrial sector was most desirable to make a headway towards peace and progress. He asked the principal secretary, industries, to formulate a proposal indicating the negative items which should be excluded from the incentive cover. Regarding the revision of power tariff, Mr Sharma directed for making a rational proposal which did not put burden on entrepreneurs. “No person, including private firms and NGOs, would be allowed to go scot-free. A close check on NGOs that receive the Centre’s grant on the recommendations of the state government would be made,’’ he said. Mr Sharma said since the implementation of projects allotted to the NGOs were to be supervised by a nodal officer appointed by the state, all NGOs which failed to come up to the expectations would be blacklisted. The state government has decided to attract domestic and international investors in this sector by providing infrastructure and cashing in on its vicinity to Delhi. According to officials in the Department of Industry, Haryana, the export of gems and jewellery from India has reached $ 9.1 billion and this is likely to touch $10 billion this year. According to estimates of the Gem and Jewellery Export Promotion Council of India, the total export of gems and jewellery will cross $16 billion by 2010. After Surat and Jaipur, Gurgaon can emerge as a major attraction for investors. A number of companies like Radico, Himanshu, LM, Transworld, Aay Kay International, Madnik and Aay Kay International have made large-scale investments at Delhi and Noida to export beaded, metal and wooded jewellery, besides gems. The Haryana Chief Minister, Mr Om Prakash Chautala, is trying to woo investors of Mumbai and Gujarat to invest in gems and jewellery trade. However, it remains to be seen whether the state can emerge as another hub of gems and jewellery exports. In terms of growth, Standard Chartered Mutual Fund topped the list posting a inflow of Rs 1,056.22 crore outsmarting larger funds like Templeton, Birla Sunlife, DSP Merrill Lynch and Tata Mutual fund, according to the fund net assets review for July. UTI MF retained its dominant position with Rs 16,388.17 crore worth of assets under management capturing 14.47 per cent of the market share. UTI’s market share came down after US-64 and other assured return schemes were separated from the NAV-based schemes, now managed by a company floated by LIC, SBI, PNB and BoB. Apart from UTI, other PSU mutual funds posted either lower growth or negative growth in sales. While SBI Mutual Fund grew marginally by Rs 64.56 crore, the mutual fund arms of Punjab National Bank and Bank of Baroda witnessed decline in growth. Except UTI, private players dominated the mutual fund industry with ICICI Prudential leading the pack with Rs 13,117 crore worth of assets under management. HDFC MF closely followed with Rs 12,421 crore while Templeton had Rs 12,003 crore and Birla Sunlife had Rs 8,147 crore. “When I read about the evils of drinking, I gave up reading” — this quote of Henry Youngman couldn’t have been more apt. A study of people aged 45 by researchers at Stirling Money Than University has revealed that moderate drinkers make on an average 17 per cent more abstainers. A survey of around 17,000 persons, which looked at their relationship, careers and drinking habits, has found that on an average, drinkers earned £13,780 a year, nearly £2,000 more than teetotallers. Even heavy drinkers, defined as men who drank more than 50 units of alcohol a week and women who drank more than 35 units, earned 5 per cent more than teetotallers, says a report in The Telegraph. The country’s tea export between January and June, 2002 stood at 79.32m kg. Officials said the export in June 2003 was down by about 8 per cent to 12.09m kgs from 13.14m kg in the corresponding month of previous year. Tea exports during the period was down mainly due to practically nil exports to Iraq since the last week of April. Iraq had imported about 43m kg of tea from India in 2002. In addition to Iraq, exports were down also because of less buying from Russia, which was now importing more of orthodox tea from Sri Lanka. Tea production between January and June this year had jumped by 10.35 per cent to 314.08m kg from 284.62m kg in the corresponding period of last year, the official said. Hyundai Motor India today flagged off maiden shipment of its flagship “Santro” brand of passenger cars to European markets of Italy, Spain and Netherlands. The first consignment despatched from the Chennai port consists of 1,500 units of Santro to be marketed in Europe under the brand name “New Atos Prime” at a price of over 8,500 euros, J I Kim, Managing Director of the company told reporters. 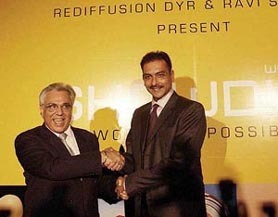 MUMBAI: Zee Telefilms has received shareholders’ approval for writing off the value of its investments in two wholly-owned subsidiaries, Econnect India and Zee Interactive Learning Systems, at a court-convened extraordinary general meeting. The company received shareholders’ approval on August 8, 2003, which entails it to make necessary adjustment on account of capital restructuring of its subsidiaries, Zee Telefilms informed the stock exchange, today. NEW DELHI: India’s steel industry has performed at its peak level in almost all spheres, claims the Union Steel Minister, Braja Kishore Tripathi. The minister said exports of finished steel increased by 37 per cent, form 2.7million tonnes in 2001-02 to 3.7 million tonnes in 2002-03. Significant improvement was evident in the exports of semi-finished steel, stainless steel and pig iron. MUMBAI: HDFC Standard Life Insurance Company expects a first premium income of Rs 300 crore from individual policies even as it plans to raise its capital base by Rs 75-80 crore in the fiscal 2003-04. “We have registered a premium income of Rs 37 crore in first quarter ended June, 2003 of the current year and expect it to touch Rs 300 crore in financial year, 2004, HDFC Standard Life Managing Director Deepak Satwalekar told newspersons here yesterday after launching the gratuity plan, a group insurance product. NEW DELHI: Cement production recorded a 2.63 per cent increase in July, 2003 to 9.37 million tonnes from 9.13 million tonnes in the year-ago month. Despatches also rose 1.1 per cent to 9.19 mt from 9.09 mt in the monthly review period, according to the latest update by the Cement Manufacturers’ Association. NEW DELHI: State Bank of India today said it aims to retain at least 25-30 per cent of the Rs 25,000 crore Resurgent India Bonds proceeds by launching an “instrument” having both fixed and floating rates in September. “Our efforts are to retain 25-30 per cent of the RIB proceeds back to the system,” SBI chairman A. K. Purwar said after a branch inauguration at Dasna near Ghaziabad. He said the bank was planning to come up with an “instrument” which will offer an option to RIB holders to park their money after the bonds mature in October.